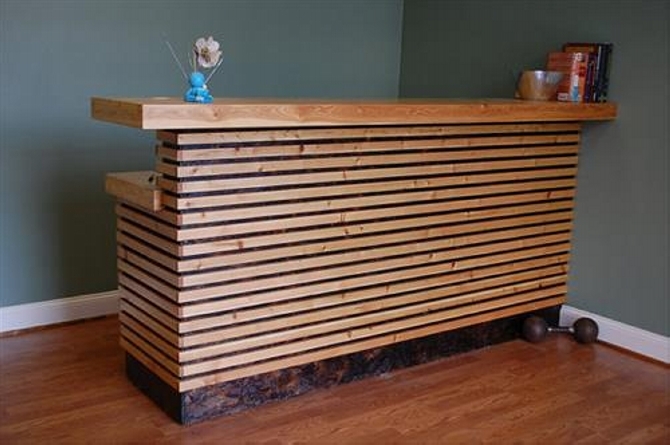 What exactly comes in your mind when we talk about a wooden desk? Well, this might be an information desk, or an emergency desk, this can also be an official desk. 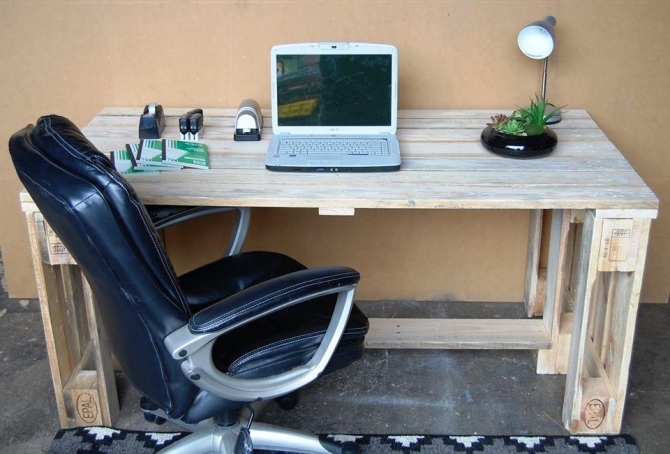 Being specific towards the term desk, we conceive a sophisticated wooden installation similar to a long wooden desk that is installed on the venue that can be used official or for some domestic work on it. 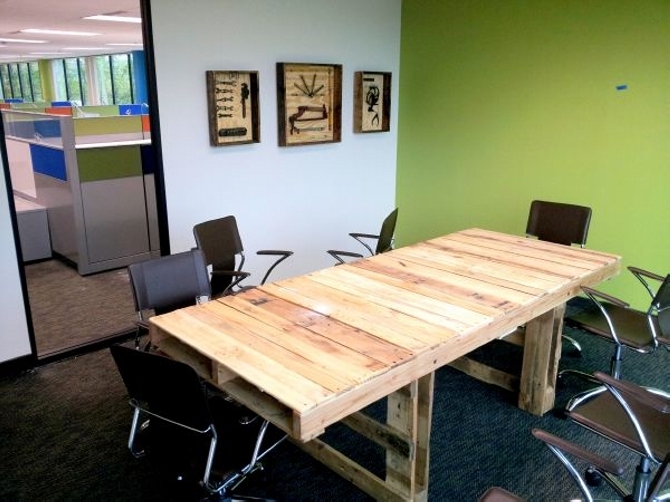 We have already worked on a number of commercial pallet wood creations, here are some more decent pallet wood desk ideas that you can recycle for your office or even for your house as well. 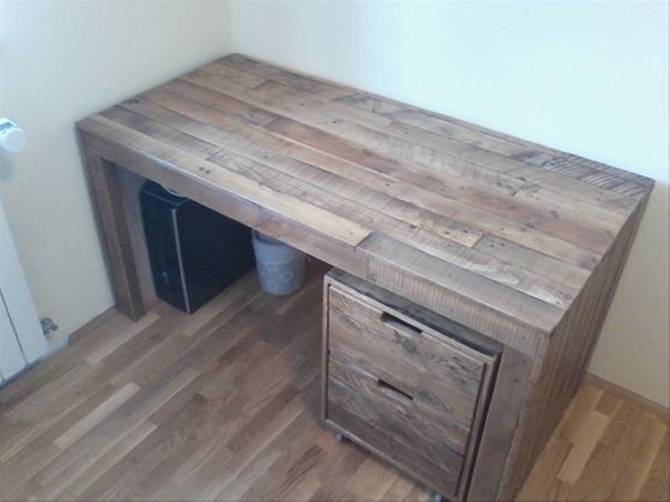 In my flawed opinion, a desk is associated with the official atmosphere and is related to the official work. 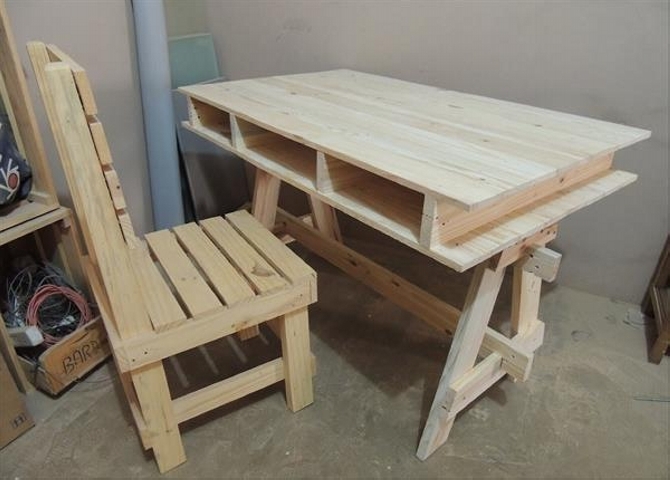 So this wooden table along with an executive chair makes a pretty perfect combination for some official work. We have provided the wooden desk with all internal shelves and racks. Now turning towards the next wooden desk, we gave it an industrial look by fixing couple of reclaimed metallic legs while the rest of the structure is made using the same shipping pallets. 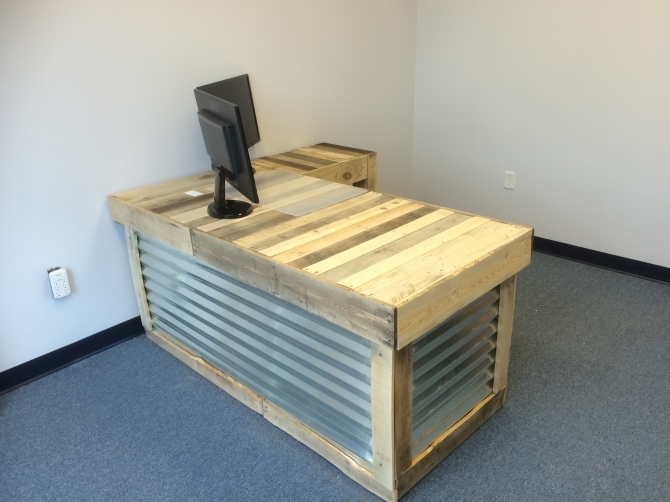 On side we have made the mandatory racks that give this desk a professional look. 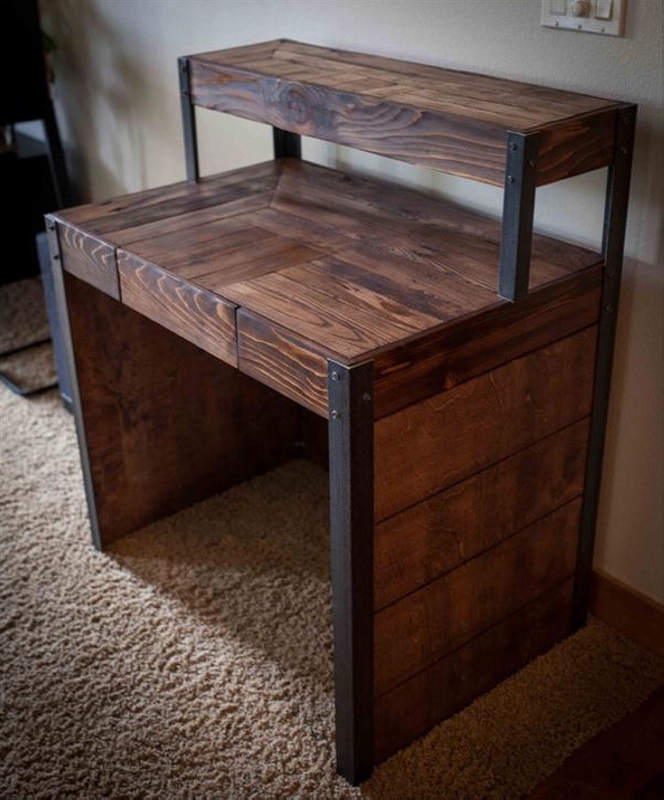 What you guys really opine about this dark shaded wooden pallet upcycled desk? It has got a commendable look along with a professional structure and shape. We have also given an industrial look by adding the metallic frames. While its multi tiered structure would be thorough support in your official work. 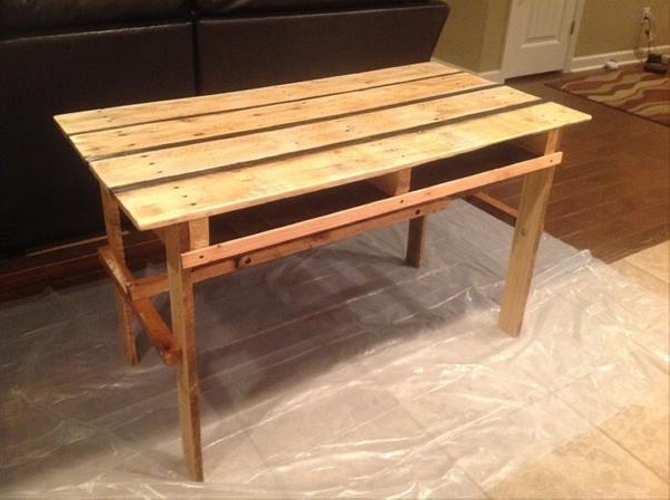 Here comes a simple yet decent pallet wood desk. 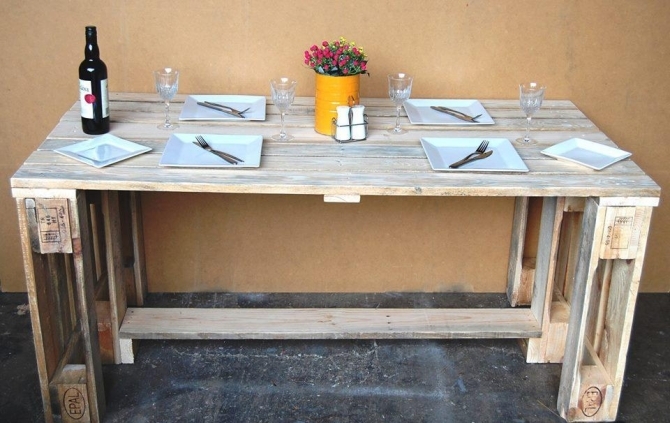 Apparently this might look like a fine dining table but basically this is a multi purposed wooden pallet desk that can also be used for some official work thick pallet planks on the base make it a stronger furniture item for some heavier tasks. 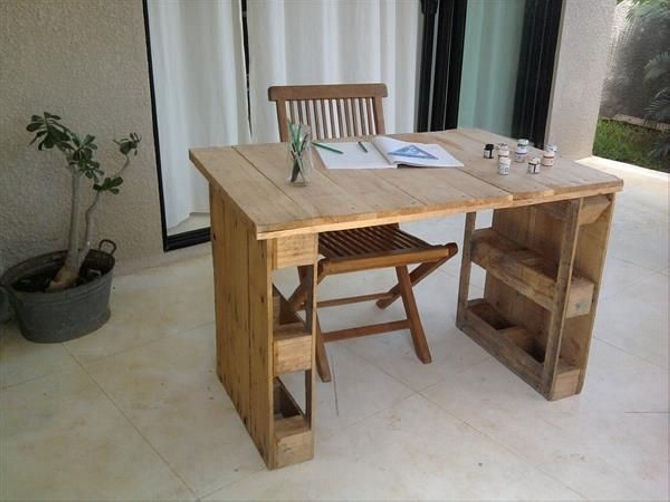 We said in the beginning that you can also recycle a couple of wooden desks with shipping pallets for your domestic use. 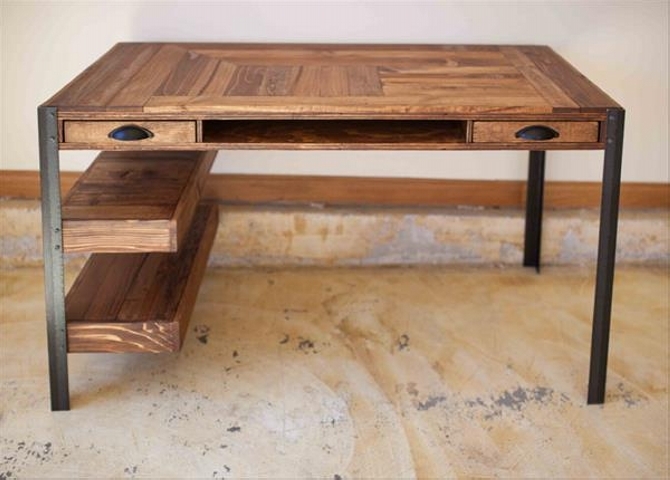 We demonstrated it in the shape of this desk which we have used to carry a delicate music system. There is also an additional drawer for some extra devices that need to be attached along. 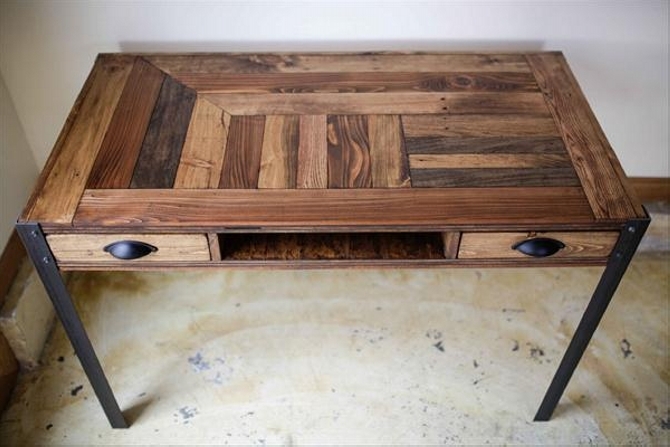 Now this is something classic made with the pallet wood. To give it a fancy look we have made some special arrangements, we did some lighting work inside the base of the desk. 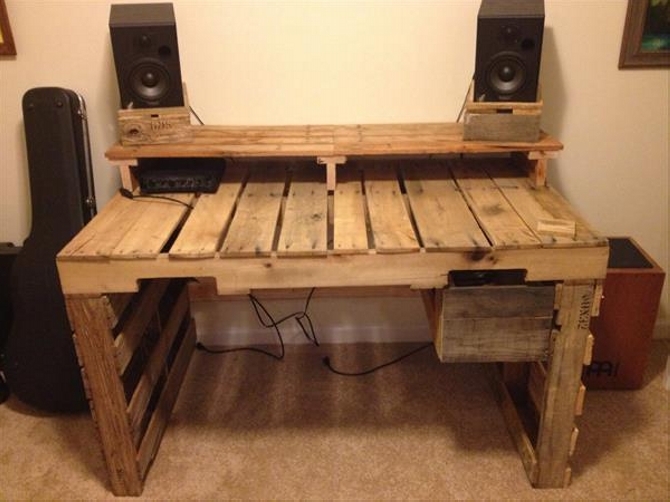 This sort of fancy wooden pallet desks would just do great in some bars or cafes. 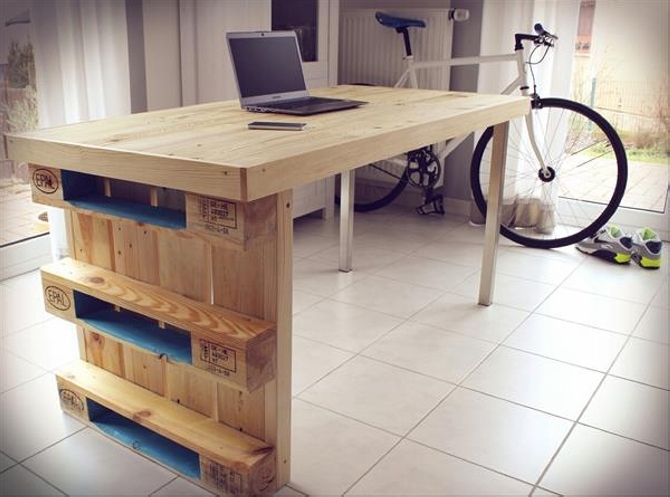 Wow, a pallet wood desk on wheels. The leveled top is a perfect place for keeping your laptop for official correspondence. 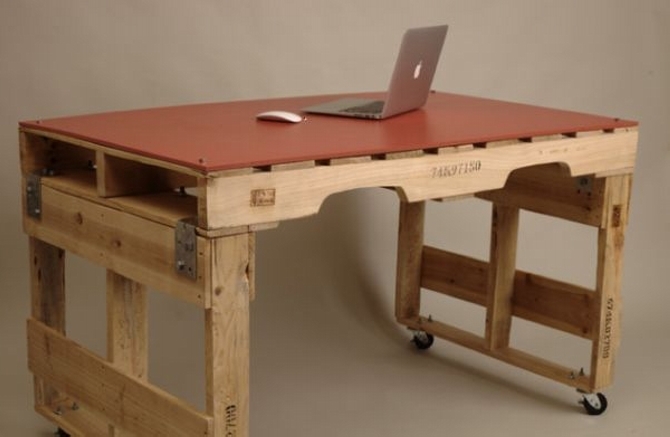 Fixing the wheels on the base means that you can simply drag your office with a mild push and place it wherever you want. 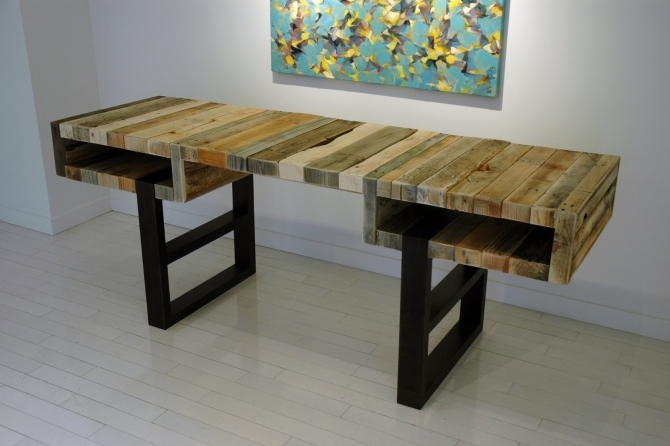 We had a discussion earlier on this shipping pallet wood recycled desk. We made it fancy for some certain uses. 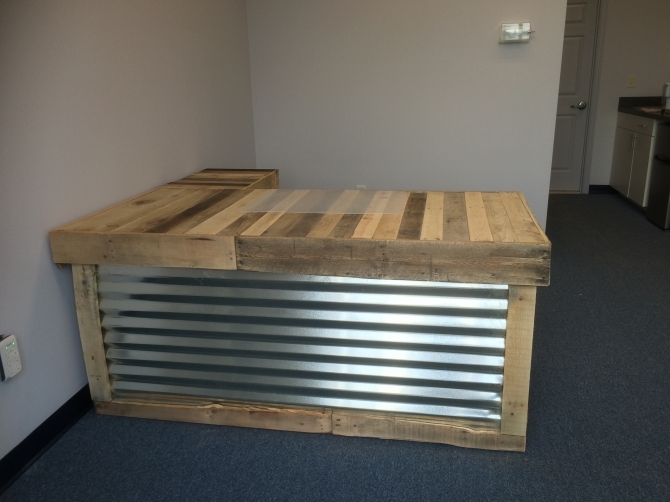 This makes a perfect installation especially for bars and cafes or some other public places. While selecting the pallets we ensured their fineness and quality to ensure the optics.